Our mind is extremely important in spatial memory – any time we enter a new place, our brain interprets our environment and takes physical cues to assemble a mental field map. This map remains archived in the deep recesses of our mind and is retrieved when, if ever, we enter the same space again. This map remains archived in the deep recesses of our mind and is retrieved when, if ever, we enter the same space again. This thesis challenges architecture to learn from spatial memory and navigatory relationships to design with more careful, corporeal considerations. The hotel operates as a testing field for memory since guests often get a limited time to become familiar with their environments, pressuring design to offer an experience that will remain in the user’s mind long-term. A shared ideal by all hotels is to offer guests a special and memorable experience. Unfortunately, hospitality architecture has plateau in the last decades and all we have is long corridors with stacked parcels inside an extruded tower. To design a memorable hotel, we must understand how memory operates in our brain. The site selected for this project is underneath the Queensboro Bridge in Roosevelt Island, and it would be a Statler Hotel servicing the Cornell Tech campus. As part of the design process, I have analyzed both the Queensboro Bridge and the existing Statler Hotel in Ithaca. Analyzing the research from the Academy of Neuroscience for Architecture, I concluded that there are five physical cues that can make a space more memorable – Depth, Complexity, Landmark, Symmetry, & Repetition. Architecturally, based on the strong relationship between memory and navigation, I identified a hotel guest’s purest sequence of circulation – Entrance, Lobby, Elevator, Hallway, & Guestroom. I used these ten concepts as an index to derive design. 2D & 2D modeling software. After defining these 5 cues within the contexts of neuroscience, American dictionary, architecture, and hospitality, I defined them through the lens of the Queensboro Bridge in New York and the Statler Hotel in Ithaca, New York, using conventional graphic methods of architecture to represent evidence of the cues on the bridge and the hotel. These architectural drawings eventually became “operative diagrams” which allowed me to question the pure idea of the cue. For example, the floor plan of the lobby, when subjected to repetition and symmetry, increases in complexity. The bridge façade, when mirrored symmetrically, adopted a repetitive pattern it did not have before, becoming a completely new, de-familiarized version of the original. I used these 2D diagrams as instruments to generate 3D form on the site, imagining that, “other than the bridge and statler hotel, what type of space could also result in these drawings?” and manifested those potential spaces on the site. One thing that quickly became clear in the site and program analysis was that the cues were present in more than one moment in the bridge and hotel experience. Both in Queesboro Bridge and the Statler Hotel, the five cues are integrated – a form of Gestalt in which the perception of the whole is different than that of the summation of the pieces. 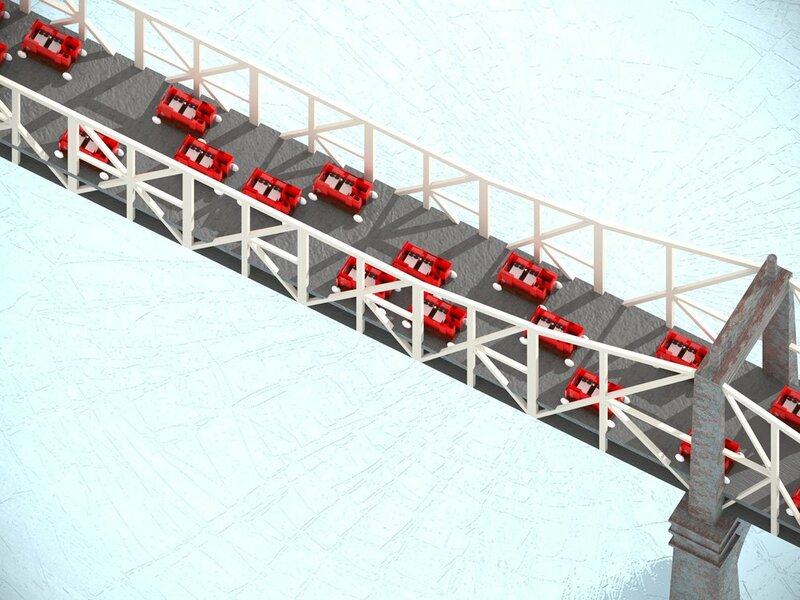 For example, an elevation of the bridge shows repetition, but it also shows symmetry. The hotel lobby in photography shows symmetry, but the plan reveals complexity. The proposal for the Roosevelt Island’s Tech Campus will enable Cornell University to establish a stronger presence in New York City. This master plan, designed by Skidmore, Owings, & Merrill, though capitalizing on the ‘spine’ circulation typology of the island, struggles to suggest an academic community with a more careful integration. The plan calls for individual, internalized buildings to be distributed down the island at an angle, framing Manhattan. But the current progress has individual architects designing their buildings without a clear relationship to each other. An academic campus must always foster an essence of community and unity – its buildings are the first step in doing so. The most beautiful and significant context, the Queensboro Bridge, has been ignored by the residential and conference towers. This scenario begs for an intermediary between the Cornell Tech development and the rest of Roosevelt Island – my thesis will attempt to be that intermediary. By inserting a hotel underneath the Queensboro Bridge, the campus and the island will once again try to renew relationships and mediate their disconnection. It will additionally behave as a proper gateway into the campus, celebrating that transportation hub of bridge, pedestrian, tram, subway, and future water taxi, infrastructures. By mediating the site with a Statler Hotel, we would be allowing the Ithaca property and campus to expand towards New York City, giving students the opportunity to experience and practice in an urban setting. What if instead of 200 guestrooms for 200 guests, a hotel had 1 guestroom for 200 guests? What if if instead of an elevator, guests were transported to their rooms via a system of gears? What if instead of cars, the guestroom transported users from airport to hotel? Thank you to my parents, for whom with them, this thesis research would not exist. It is thanks to them that I can confidently perform any task with integrity and tenacity. Thank you to my mother, Liliana, whose powerful love and guidance enabled me to seek excellence and happiness in everything I attempted and never once doubt myself. Gracias por todo mama, te quiero mucho. Thank you to my father, Manuel, whose wise advice and lessons always supported my academic, professional, and personal aspirations. Gracias papa, te quiero mucho. Thank you to my advisor, Werner Goehner, whose contagious energy has always motivated me to hold a strong architectural position. Thank you to my advisor, Andrew Lucia, whose architectural curiosity stimulated my own perceptions of design and space. Thank you to my good friends and roommates at Cornell, whose patience and encouragement allowed me to reach this success. Thank you to Professor Bradford Wellstead, whose wisdom and expertise allowed me to explore and develop new, bold concepts of hospitality design. Thank you to Prof. Stephani Robson, whose time and energy encouraged me to search for ways to improve the hospitality industry and the guest experience for users. Thank you to Mr. Richard Adie, whose expertise in hospitality offered this thesis research a unique angle and helped give it a strong direction towards becoming a solid proposal. Thank you to the Hotel Ezra Cornell organization, whose opportunity to participate gave me valuable experience and even more valuable relationships with remarkable individuals. Thank you to Kelcey Wolff, Nikol Limaduran, Margalit Kohanim, and Tess Williams, whose faith in my ability to design for the hotel industry allowed me to challenge, question, and at times, improve hotel-design at the Statler Hotel in Ithaca. Thank you to the Statler Hotel Banquets Department in Ithaca, whose welcoming and energetic coworkers taught me the importance of an efficient and team-oriented back-of-house as well as engraving in my mind the skill of always anticipating a guest’s needs. Thank you to the Academy of Neuroscience for Architecture, whose opportunity to participate in their Salk Institute 2014 Conference encouraged me to continue researching and to always design for the good of all people. Thank you to Caesar’s Entertainment and Gary Austin, whose generous time and resources enlightened my perception of hospitality operations and the people that are a part of it. Thank you to my mentors at the Rockwell Group, Jonathan Elmore and Richard Chandler, whose motivation and energy during my internship demonstrated that design curiosity is at its strongest when you are surrounded by the right people. Thank you to West Valley High School and the Hemet Unified School District, for preparing me for higher education and always reminding me of the importance of community and giving back. Thank you to Mr. Mark Lenoir, whose trust and vision taught me to go for big, bold goals and change what needs improvement. Thank you to Patricia Chavez, who instilled in me the creative discipline that allowed me to succeed in architecture and design, always seeking detailed and ambitious projects with confidence and energy. Thank you to Donna Parker, who made it possible for me to attend Cornell University with unquestionable support and faith in my ability to make a difference for myself, and others. Thank you to Tamara Muizelaar, who first triggered in me a curiosity for learning more and new ideas, stepping out of my comfort zone, and always attempting to make a positive difference. Thank you to my AVID teacher, Janice Jones, whose enthusiasm and love for teaching motivated me to be a more active student and a more curious designer, always seeking knowledge. Thank you to the AVID program for preparing me to attend college and teaching me to learn and research ideas and information. Thank you to my brother, Manuel ‘Limousine Man’ Alvarez, who without a moment’s hesitation would advice for what was the best thing to do, but most importantly, for what was right and always do what makes one happy. Gracias por ser un gran hermano. Thank you to my family, Nazareth, Grethel, Porfirio, and Constanza, who always inspired me to be ambitious and do whatever it takes to be a well-rounded, successful individual. Los quiero mucho. Thank you to my grandmother, Yomami, whose strength and decision taught me to always step forward with tenacity and never question one’s own mind. Te quiero mucho. Thank you to my grandparents, Mama Coco y Abuelo, whose love and energy has taught me to respect and have faith in others, myself, and God, and always know that family is the most important thing. Gracias y los quiero mucho. Thank you to Cornell University for taking a chance when accepting me into the architecture program and changing my life completely; I am a better man because of it. International, DOI: 10.1080/17508975.2012.702863. 2012. Print. Bagli, Charles. Waldorf Astoria to Be Sold in a $1.95 Billion Deal. The New York Times, Oct. 6, 2014, <http://www.nytimes. Bingham, Neil. 100 Years of Architectural Drawing: 1900 – 2000. London: Laurence King Publishing, 2013. Print. Ferriss, Hugh. The Metropolis of Tomorrow. Mineola: Dover Publications, Inc., 2005. Print. Gibson, James. The Ecological Approach to Visual Perception. Psychology Press, 1986. Print. Chapter 11. Kahn, Fritz. Fritz Kahn. Germany: Taschen, 2013. Print. Smithsonian Institution Press, 1991. Chapter 1. Print. Koolhaas, Rem. Delirious New York. United States of America: The Monacelli Press, 1994. Print. Koolhaas, Rem and Bruce Mau. S,M,L,XL. New York: The Monacelli Press, 1995. Print. Lin, Ingrid. Evaluating a Servicescape: the Effect of Cognition and Emotion. State College: Elsevier Ltd, 2004. Print. York: Princeton Architectural Press, 2005. Print. McEnaney, Liz. Roosevelt Island: Preserving Urban Design and Innovation. New York: Columbia University, GSAPP, 2014. Muller, Robert. A quarter of a Century of Place Cells. Neuron 1996. 1-10. Print. Pallasmaa, Juhani. The Eyes of the Skin. Chichester: John Wiley & Sons LTD, 2012. Print. Penner, Richard H., Lawrence Adams, Sephanie Robson. Hotel Design, Planning and Development. New York: W. W.
Norton & Company, Inc., 2013. Print. Rohan, Timothy. The Architecture of Paul Rudolf. New Haven: Yale University Press, 2014. Print. Serafini, Luigi. Codex Seraphinianus. New York: Rizoli, 1981. Print. Shapiro, Matthew, Plasticity, Hippocampal Place Cells, and Cognitive Maps. Basic Science Seminars in Neurology. 2001. Representation of Local and Distal Stimuli. HIPPOCAMPUS. 1997. 1-19. Print. Vidler, Anthony. Warped Space: Art, Architecture, and Anxiety in Modern Culture. Cambridge: The MIT Press, 2000. Wills, Tom J. Attractor Dynamics in the Hippocampal Representation of the Local Environment. Science. 2005. 1-5. Print. Information about Different Types of Memory Episodes Occurring in the Same Location. Neuro 2000. 1-11. Print.